These lovely colored cakes caught my Josh' attention while we're visiting the new bakery around the corner. The new bakery has about more than a dozen of cake varieties ranging from mocca, marble, choco, ube and many other flavors. Of course I love choco but Josh like marble so we decided to buy the two plus another choco cake which has a choco filling in between for my Mom. Well from the looks of it esp. the icing you would mistake this cake as over sweet but when we tasted it it's not so sweet but very yummy! The taste is not the usual taste of cakes bought from normal bakery within the areas. Actually it can compete the taste of 'G' especially their round cake ala Oreo inspired cake which costs around P200 only. Anyway we promised ourselves to round up their array of baked goodies aside from cakes. 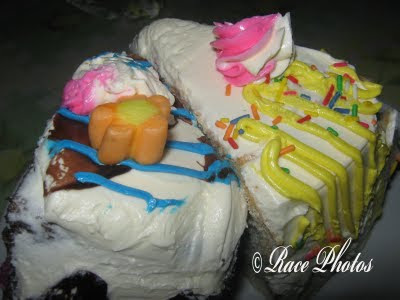 Btw the sliced cakes price range is P12-P15 only, isn't it competitive? It’s great to relax, bond with your family and watch your usual favorite television shows. Working in an office or in field works somehow gives you stress and back pain that you want to just sit in your sofa and let movies or sport shows entertain you. Well if you really want to do that and you’re a sport enthusiast you might as well watch National Football League through Direct Satellite TV. Be sure to get yourself an nfl sunday ticket so all you have to is watch NFL games in the comfort of your home. No need to travel and spend lots of your time just to get there! For those who want to follow all NFL football games you just have to browse their site and find how much is the nfl sunday ticket price. You’ll see it’s also affordable with all the good packages within. You’ll really enjoy your visit especially as you’ll know the nfl sunday ticket schedule. Now you’ll have a really fun watching day with your family as you all watch your favorite National Football League players. Just imagine watching it in the confines of your home with your family and some popcorn too! Happy viewing!